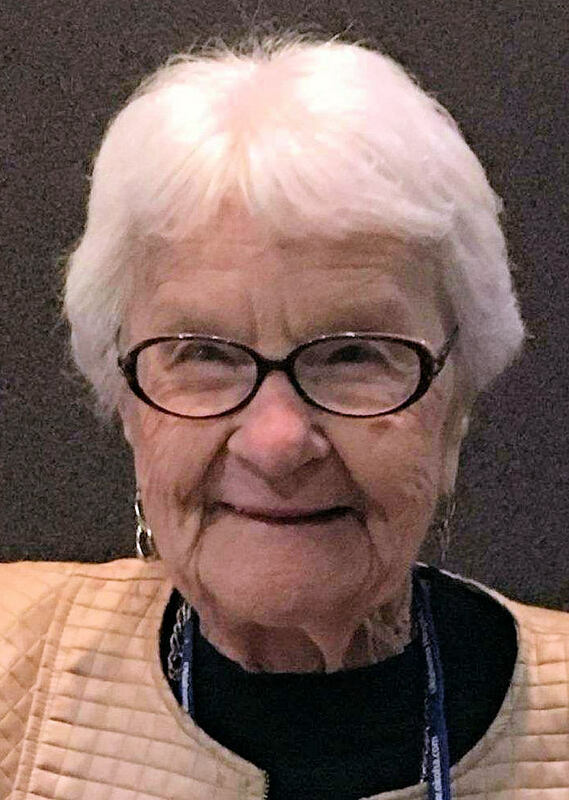 Flora Dell (Toady) Nason Due was welcomed into the loving arms of Jesus on April 3, 2019. She was born January 2, 1925, at Rabbit Creek near Randlett, OK to Albert (Bertie) and Mary Tuel Nason. The family later moved to Randlett where Toady attended school and played basketball, graduating in 1942. After graduation, Toady moved to Ft. Worth, TX along with her sister, Doris, and a few friends. They lived and worked in Ft. Worth during WWII, returning home after the war. She married the love of her life, Elmer Louis Due, on March 23, 1946, and moved to Bridgeport, CT. Their son, Terry, was born in 1946 while in Bridgeport. When Terry was almost one, the family moved back to Randlett where they lived until Elmer was hired at Halliburton in Duncan. Their daughter, Marsha, was born in 1948, the day after Elmer started work for Halliburton. The family’s third child, Tana, was born in 1951. In early 1952, Elmer and Toady were invited to Immanuel Baptist Church where they both accepted Christ and were baptized. Toady enjoyed being a homemaker, having coffee with her neighbors, and sewing all the clothes her girls ever wore. She always said the hardest thing she ever made was Marsha’s box pleated cheerleading skirt. Toady started working at The Duncan Banner when Marsha started college in the fall of 1966. She began her career in classifieds and was head of display advertising when she retired in 1978. After Elmer died in 1987, Toady took pride in taking care of her lawn and garden and being involved in her church. When her first great grandchild, Bethany, was born in December of 1987, she spent the next 3.5 years being her primary babysitter. She later was a volunteer at the information desk of Duncan Regional Hospital, always ready to give a needed hug. In 2003, Toady became a charter member of New Hope Baptist Church West, where she remained active until unable to attend due to her health. Toady moved to Chisholm Trail Assisted Living in 2016. After breaking her second hip in 2017, she made the decision to move to Elk Crossing where life came full circle with that first great grandchild taking care of her. Toady is survived by her daughter, Tana and Jerry Gregston; granddaughter, Jana and Darren Bridges; grandsons, Jay and Jill Gregson, Jack and Jeanne Gregston, Lance Due, and Adam Due; son-in-law, Joe Sam Vassar. She is also survived by great grandchildren, Bethany and Silas Stewart, Kelsey and Jackson Stone, Jake and Kylee Gregston, Jared Gregston, Jayne Gregston, Derek Bridges, Jaxon Gregston, and JJ Gregston; and the light of her life, great great granddaughter, Sutton Sloan Stewart. She was preceded in death by her parents; her husband, Elmer; son, Dr. Terry L. Due; daughter, Marsha Vassar; and her sisters, Wilda Killingsworth and Doris Boles. In lieu of flowers, donations can be made to Due Unto Others, her grandson’s mission organization that bears her name, C/O Jay Gregston, 5900 Mosteller Drive #122, Oklahoma City, OK 73112. A celebration of her life will be held Saturday, April 6, at 1:00 PM at New Hope Baptist Church West with Rev. Randy Southerland officiating. Burial will follow in the Duncan Cemetery. The family will hold visitation Friday, April 5, 5:30-7:30 PM at Whitt Funeral Home in Duncan.